Even though it’s been 3 years the restaurant hasn’t appeared to change much. Although fairly non-descript on the outside the inside has a medieval feel to it (click on the photo for a better view). Even though it has a high roof in the main part of the restaurant the use of drapes and banners gives a warm cosy feel. The front of the restaurant has a wood burning stove which enhances the ambience – especially when the owner Georg Fuchs managed to fill the room with smoke! Even though it was a Tuesday the restaurant was quite busy. We turned up without booking and got a table easily though. We both chose off the 2 courses for £12 menu. The food arrived quickly and was very good. Service was a little haphazard with one of the waitresses going into panic mode several times. 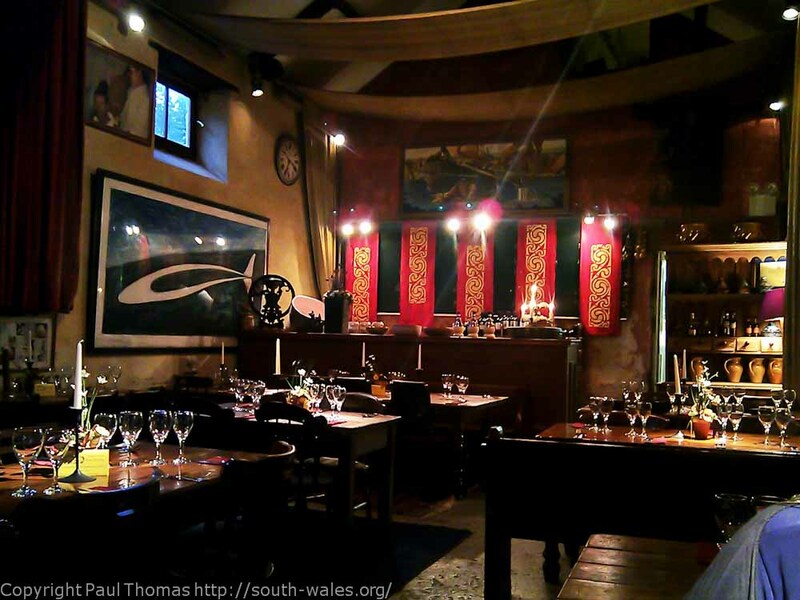 Illtud’s 216 is well worth a try if you’re visiting Llantwit Major. They are open Tuesday to Sunday from 10:30 am for morning coffees, from 12:00 pm to 2:30 pm for lunch and from 6:00 pm to 9:30 pm for dinner, and Sunday’s from 12:00 pm for a traditional Sunday lunch.